Staatliches Bauhaus ( listen ), commonly known simply as Bauhaus, was an art school in Germany that combined crafts and the fine arts, and was famous for the approach to design that it publicised and taught. 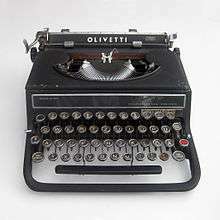 It operated from 1919 to 1933. At that time, the German term "bauhaus" —literally "construction house"—was understood as meaning "School of Building". 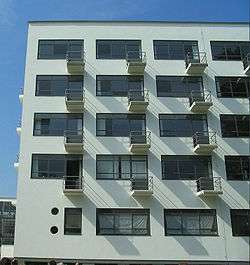 The Bauhaus was founded by Walter Gropius in Weimar. In spite of its name and the fact that its founder was an architect, the Bauhaus did not have an architecture department during its first years of existence. Nonetheless, it was founded with the idea of creating a "total" work of art (Gesamtkunstwerk) in which all arts, including architecture, would eventually be brought together. The Bauhaus style later became one of the most influential currents in modern design, Modernist architecture and art, design and architectural education. The Bauhaus had a profound influence upon subsequent developments in art, architecture, graphic design, interior design, industrial design, and typography. 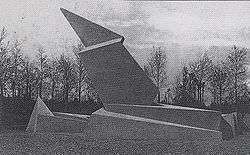 For more details on this topic, see New Objectivity (architecture). However, the most important influence on Bauhaus was modernism, a cultural movement whose origins lay as early as the 1880s, and which had already made its presence felt in Germany before the World War, despite the prevailing conservatism. The design innovations commonly associated with Gropius and the Bauhaus—the radically simplified forms, the rationality and functionality, and the idea that mass-production was reconcilable with the individual artistic spirit—were already partly developed in Germany before the Bauhaus was founded. The German national designers' organization Deutscher Werkbund was formed in 1907 by Hermann Muthesius to harness the new potentials of mass production, with a mind towards preserving Germany's economic competitiveness with England. In its first seven years, the Werkbund came to be regarded as the authoritative body on questions of design in Germany, and was copied in other countries. Many fundamental questions of craftsmanship versus mass production, the relationship of usefulness and beauty, the practical purpose of formal beauty in a commonplace object, and whether or not a single proper form could exist, were argued out among its 1,870 members (by 1914). Even before the Nazis came to power, political pressure on Bauhaus had increased. The Nazi movement, from nearly the start, denounced the Bauhaus for its "degenerate art", and the Nazi regime was determined to crack down on what it saw as the foreign, probably Jewish influences of "cosmopolitan modernism". 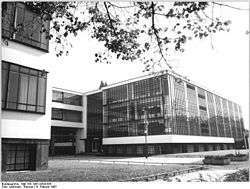 Despite Gropius's protestations that as a war veteran and a patriot his work had no subversive political intent, the Berlin Bauhaus was pressured to close in April 1933. Emigrants did succeed, however, in spreading the concepts of the Bauhaus to other countries, including the “New Bauhaus” of Chicago: Mies decided to emigrate to the United States for the directorship of the School of Architecture at the Armour Institute (now Illinois Institute of Technology) in Chicago and to seek building commissions. [a] The simple engineering-oriented functionalism of stripped-down modernism, however, did lead to some Bauhaus influences living on in Nazi Germany. When Hitler's chief engineer, Fritz Todt, began opening the new autobahn (highways) in 1935, many of the bridges and service stations were "bold examples of modernism"—among those submitting designs was Mies van der Rohe. Walter Gropius, Marcel Breuer, and Moholy-Nagy re-assembled in Britain during the mid 1930s to live and work in the Isokon project before the war caught up with them. Gropius and Breuer went to teach at the Harvard Graduate School of Design and worked together before their professional split. Their collaboration produced The Aluminum City Terrace in New Kensington, Pennsylvania and the Alan I W Frank House in Pittsburgh, among other projects. The Harvard School was enormously influential in America in the late 1920s and early 1930s, producing such students as Philip Johnson, I.M. Pei, Lawrence Halprin and Paul Rudolph, among many others. The White City of Tel Aviv (Hebrew: העיר הלבנה‎‎, Ha-Ir HaLevana) refers to a collection of over 4,000 Bauhaus or International style buildings built in Tel Aviv from the 1930s by German Jewish architects who emigrated to the British Mandate of Palestine after the rise of the Nazis. Tel Aviv has the largest number of buildings in this style of any city in the world. In 2003, the United Nations Educational, Scientific and Cultural Organization (UNESCO) proclaimed Tel Aviv's White City a World Cultural Heritage site, as "an outstanding example of new town planning and architecture in the early 20th century." Established in 2000, the Bauhaus Center in Tel Aviv is an organization dedicated to the ongoing documentation of the architectural heritage. 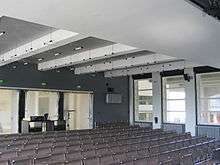 In 2003, it hosted an exhibition on preservation of the architecture that showcased 25 buildings. To further the architectural culture in the city, a small Bauhaus Museum opened in Tel Aviv in 2008, designed by Israeli architect Ron Arad. 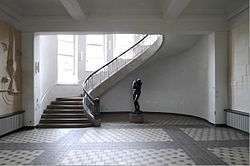 Artists who were educated, or who taught or worked in other capacities, at the Bauhaus. ↑ "Bauhaus". Encyclopaedia Britannica. Retrieved 14 June 2016.